Tag Archives for " Vocus "
Over the course of the last few weeks I had the chance to team with Vocus (NASDAQ: VOCS), a leading provider of cloud marketing software, to analyze the results of a new survey of 400 decision makers at small- and medium-sized businesses (SMB) and their use of social media, which shows among other things, that small business and social are coming to terms. The study reinforced something that I’ve been noticing more and more, that there’s finally this acceptance that social media not only isn’t going away it’s an essential element of the marketing mix and the real challenge now is to figure out how to integrate it into the total online and offline marketing presence. The data supported two trends that I found particularly interesting. First, the common social media wisdom of “more engagement over more numbers” has some room to be challenged. A large number of firms that cited social media participation as very helpful also claimed to pursue a strategy of big numbers of followers over more engagement. There were other factors that came into play, but a case can be made for either approach when executed well. The other trend suggested there are growing pains in social media that line up nicely with the size of a business. The smallest firms seemed to get by and benefit from a guerrilla approach, while much larger firms had appointed full time staff and consultants. The firms in between, those in the $10-20 million range, found social media less helpful as they struggled to integrate it into marketing more formally. There is a strategy lesson in this data just waiting for consulting firms to exploit. Thirty-six percent of SMBs spend on median average $845 a month on software tools for social media management – but 32% of that group also spends a $1,000 or more. Separately, another 22% of SMBs use consultants to aid with their efforts, though many SMBs have simply added social media to the list of existing duties of marketing employees. The median average of tools used is three and social media accounts for 25% or more in terms of overall marketing efforts for the vast majority of SMBs. 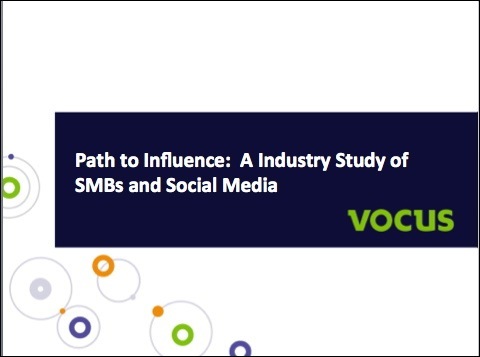 Analysis of the data points to the conclusion that SMBs are finding value in social media – yet it also demonstrates divergent philosophies on paths to finding that value. SMBs are acutely aware of the challenges with marketing through social media and though no single barrier stands out, many smaller nuisances add up to overall frustration. Overcoming the perception that social media is “free” was a frequently cited challenge. While this study clearly demonstrates that SMBs are focused on tangible business outcomes, SMBs are also capturing a myriad of metrics to measure the results of their social media efforts. The measurement of increased traffic to a web site was the most commonly cited metric with76% of SMBs measuring referral traffic from social platforms. Facebook ranked as the top social site currently used by SMBs, but ranked second to last, leading only MySpace, on future intent suggesting near saturation. Google+ proved to be the dark horse with 44% of SMBs saying they currently use Google’s social network, however it topped the list in terms of future plans – tied with Instagram at 14%. Social media is helpful: 87% of SMBs say social media has been somewhat helpful or helped a great deal; 10% said it had no effect. Perception of influence varies: 40% of SMBs prefer a smaller but highly engaged audience; 27% would prefer a huge following with little engagement. Healthy share of marketing efforts: 77% of SMBs indicate social media accounts for 25% or more of their total marketing efforts. Sharing is common use: The most common use of social media is to share information 91%; only 46% see social media as a place to handle customer service issues. Doubling up on duties: 73% of SMBs have added social media to the existing duties of a marketing person. Spending set to rise: 84% of SMBs plan to increase their use of social media at least a little in the future. The survey was conducted by an independent research firm from July 18-28, 2012. The survey looked at organizations with annual revenue between $5 and $50 million. No organization had more than 1,000 employees.